Here’s what’s happening in the world of television for Wednesday, May 16. All times are Eastern. Designated Survivor (ABC, 10 p.m.): ABC slit the throats of many a struggling show last week, including Zach Braff’s Alex, Inc., Quantico, and more. 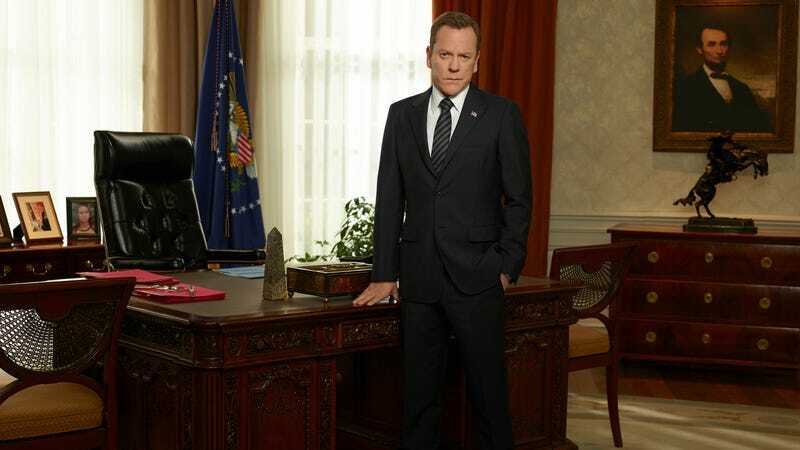 And despite the fact the numerous other series have their season finale tonight, like The Goldbergs and The Blacklist, there’s something about Designated Survivor signing off for the final time that bums us out, probably because there was something hilariously delightful about the notion of this guy being the leader of the free world. So tune in as Jack Bauer flicks off the lights in the Oval Office one final time. (Unless he’s installed motion sensor lights, or possibly the Clapper.) Our own Allison Shoemaker will weigh in with her thoughts following the episode. Seal Team (CBS, 9:01 p.m.): It’s the season finale. Will the team of seals find their way back to America? Will they shoot some guys along the way? Is anyone you know watching this show, or is it just another CBS series posting massive numbers despite a complete dearth of attention paid to it? We’re genuinely curious. But for real, check out Brockmire or Colony instead.